Greenwich’s William Nail releases a shot against Staples on Thursday night at Greenwich High. 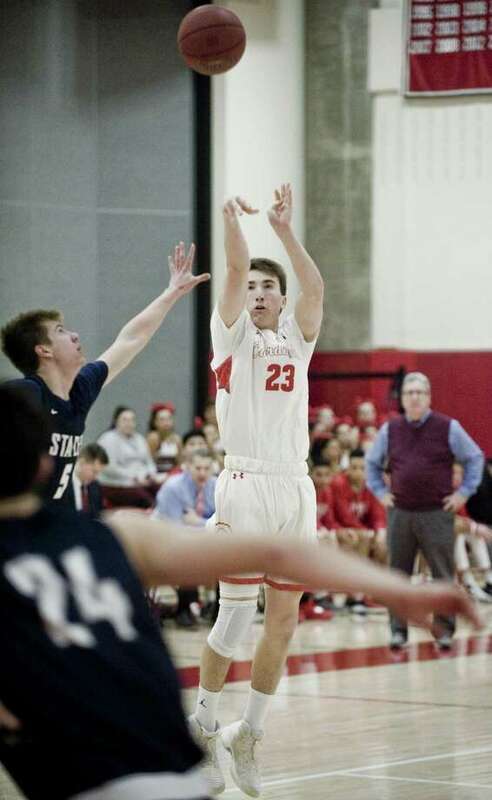 Greenwich and Staples played to a standstill for the first three quarters of Thursday’s FCIAC boys basketball matchup, with each squad displaying an effective defensive effort. Yet the final quarter belonged to the Cardinals. Tied with Staples after three quarters, Greenwich scored 11 of the first 13 points in the final quarter on its way to registering a 61-49 victory in its first home game of the season. Junior guard Chris Genaro got Greenwich off to a quick start in the third quarter, scoring 11 of his team-high 17 points, while senior guard Greg Altamore had six of his nine points in the fourth quarter. With the score knotted at 36-36 after the third quarter, the Cardinals outscored the Wreckers, 25-12 in the final quarter. Cardinals first-year coach Chris Lovermi credited his squad’s solid man-to-man defense for helping to spark the win. Oliver Milledge, a senior center, scored 13 points, while senior forwards Gavin Muir and Billy Nail added eight and seven points, respectively, for GHS (5-4). The Cards played in front of their home crowd for the first time this season, after being on the road, while the gymnasium underwent repairs due to a flood in the Performing Arts Center that effected the gym. Staples (5-6) was paced by 16 points from junior forward Jake Thaw and 10 points from senior guard Dylan Ward. The Wreckers trailed 13-4, but entered halftime with a 21-20 lead. After junior forward A.J. Konstanty’s layup off Ward pass gave the Wreckers a 38-36 seconds into the fourth quarter, Greenwich went on a pivotal 11-0 run. Milledge scored in the low post, Altamaro hit a 3-pointer off an inbounds pass and converted layup, making it 43-38 at the 6:30 mark. Altamaro drove the lane and made another layup and Milledge scored in the paint, putting GHS on top, 47-38 with 5:10 left to play. Genaro enabled the Cards to get on a roll offensively in the third quarter. He scored Greenwich’s first 11 points, behind a trio of 3-pointers and a layup off a steal. Following a slow first quarter offensively, Staples went into halftime with a one-point edge, with Thaw and Ward leading the way. Thaw’s basketball and Ward’s layup off a steal made it 21-20 heading into the third quarter. In the first quarter, Muir’s putback gave the Cardinals an 8-2 lead and Altamore’s basket off an offensive rebound made it 13-4. The win snapped a three-game losing streak for Greenwich, which hosts Stamford on Tuesday. Besides solid defensive play, key perimeter shooting from Genaro, Nail and Altamore and clutch baskets in the post, aided Greenwich’s cause Thursday night. “Once our shooters started hitting some shots, it drew the defenders who were doubling me, which opened up our inside game,” Milledge said. Genaro converted three 3-pointers and provided much-needed offense in the third quarter for Greenwich, scoring 11 points. Jake Thaw 4 5-8 16; Dylan Ward 4 1-3 10; Benjamin Feuer 1 0-0 2; A.J. Konstanty 2 2-4 6; Lucas Basich 3 0-0 8; Dylan Honig 0 0-0 0; Eleftherios Pendarakis 3 0-0 7. Totals: 17 8-15 49. Chris Genaro 6 2-2 17; Gavin Muir 3 2-4 8; Chris Mark 1 0-0 2; A.J. Barber 0 0-0 0; Greg Altamore 3 1-1 9; Billy Nail 2 2-4 7; Oliver Milledge 6 1-3 13; Luis Mercado 2 1-2 5. Totals: 23 9-16 61. 3-pointers: S — Thaw 3, Basich 2, Pendarakis, Ward; G — Genaro 3, Altamore 2, Nail.